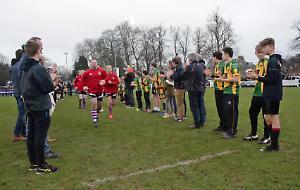 HENLEY HAWKS U12s brushed off early season rustiness with a strong showing at the Beaconsfield Rugby Festival last Sunday. The day began against a fast paced High Wycombe side. After a slow start, the Hawks rose to the challenge and a fine second half try for Charlie Hunt resulted in a 1-1 draw. Henley then went on to beat local rivals Chinnor 3-0 with tries for Oscar Thomas, Sam Winters and Ben Horner. In the next game Amersham and Chiltern proved strong opponents but Henley’s superior physicality led by Will Corbett, resulted in a 3-1 victory with well worked tries for Ben Palmer, Jake Williams and Corbett. The Hawks responded from a 4-0 defeat to Beaconsfield with a well fought 1-1 draw against a strong Windsor team in their final game, with Winters scoring his second of the day with a breakaway try after the side had gone down 1-0 early in the game. Henley debutant Conrad Morley made an excellent start to his Hawks career while Lawrence Walker and Tom Smith were given TREDS awards.